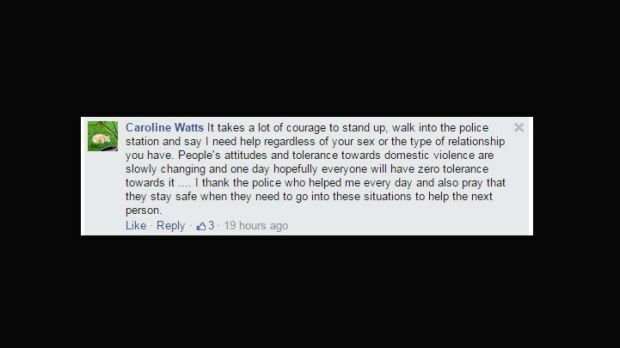 Potentially harmful comments go unmoderated on the NSW Police Facebook page. Just last weekend, two Australian women were murdered. In the first 17 days of the new year, six women have been murdered in Australia – and in every single case, the person charged with murder knew the victim. In five out of six cases, the person charged with murder is a man. 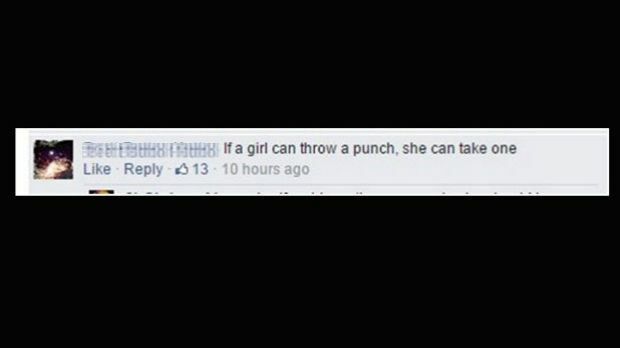 And this is the week that the NSW Police Force decided to use its Facebook page to post on men as victims of domestic violence – and allow posts like this to remain on its page. Here's the post which appeared on the page yesterday morning. "You hear her screaming. The windows breaking. You see the bruises. The look of fear in the children's eyes.The police are called. But don't assume you know how this story ends. Because she is the one who is arrested. And he is the innocent victim. He is the one living in fear. Domestic violence does not discriminate. Last year, 1 in every 5 domestic violence assaults that NSW Police responded to involving intimate partners were for male victims. The NSW Police Force has zero tolerance for domestic violence. You make the call - we'll make it stop." Yes, Australia has a domestic violence epidemic. In 2012 in NSW alone, there were 135,000 reported cases, a dramatic increase of 30 per cent over five years. In 2013, Assistant Commissioner Mark Murdoch, the NSW Police Force's corporate spokesperson on domestic violence, said DV now constitutes up 40 per cent of all police work in most commands. What's wrong with drawing attention to violence against men? Absolutely nothing – it's important to make sure that we stop violence of all kinds in all sorts of intimate partnerships. And it's vitally important to recognise that many men are victims of the violence of other men. 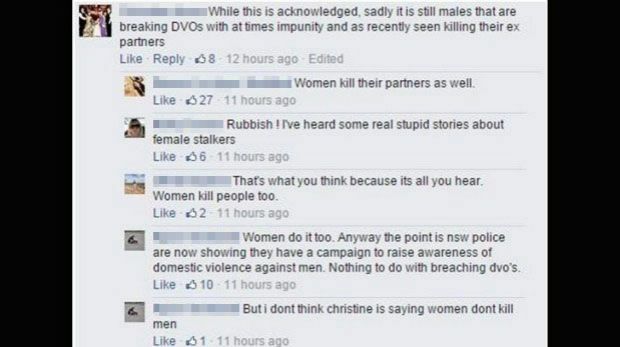 But here's what utterly shocked Moo Baulch, the CEO of Domestic Violence NSW yesterday when she saw the post. First, there were hundreds of posts on the Facebook page many of which were blaming women for violence, making false claims about the number of male victims and suggesting that men and women are equally victims of physical violence in relationships. Or this series of posts which seem to invent figures where none exist. Second, she says, there was no context for the NSW Police statistics and no explanation of how those figures were calculated. Third, there was no indication of the number of men who were victims of partner violence from other men. It is widely accepted that one in three gay men are victims of abuse in relationships and that these assaults contribute significantly to the statistics but the police post failed to mention that. Baulch questions the use of the one in five figure and was appalled that it was given such free rein. The post implied that the perpetrators were women – Baulch says categorically that's wrong. She said that using Police assault rates as a measure of the prevalence of domestic violence is wrong for a number of reasons. Many women choose never to report to police, others live in fear for many years but are never physically abused, whilst perpetrators have become clever at calling police and claiming to be the victim to exert power and control over their partner as part of the pattern of abuse. When a woman has had her sense of self-esteem systematically eroded and her partner tells her that she's crazy and her kids will be taken away then she's unlikely to call the police or any other support service for that matter. 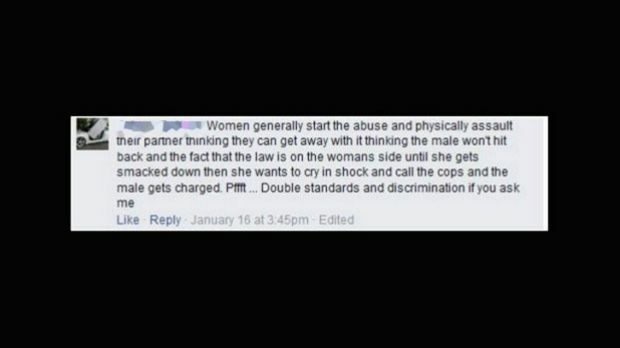 Moo rang NSW Police yesterday and was told that the post was "popular" and was part of a series of posts on domestic violence. The way we need to talk about violence – in general – needs to be respectful. We need to talk about men as victims of abuse in relationships. But the conversation also needs to be accurate, no matter where we base our discussions. In 2012, Michael Flood delivered a speech to the Queensland Centre for Domestic and Family Violence Research. In it, he debunked the concept of one in five men as victims of partner violence – a product, he said, of an inaccurate analysis of the ABS Personal Safety Survey which asks people if they have ever been victim of one of a number of physically aggressive acts – from pushing to hitting, slapping and biting. Yes, in 2011, 73800 women and 21,200 men answered yes to one of those questions. But he argues that domestic violence is more than one of those acts on one occasion. As he said at the time, those violent acts are not ok but it is different from making claims about living in fear or suffering injury. Domestic violence is about power and control. Last year, Julia Mansour, Women's Legal Services NSW, reported that since 2008, Women's Legal Services NSW had seen an increase in the number of apprehended violence orders (AVOs) against women where the women were, in fact, the victim. Mansour wrote: "The study findings include that over two-thirds of our women clients defending AVOs reported that they were the victims of violence in their relationships. Fewer than 40% of these clients had a final AVO made against them when the case came before the court." She also found that many of the women defending AVOs reported that when police had been called after a violent incident, they felt that their version of events had not been viewed as credible compared with the other party, due to the circumstances of their heightened stress and anxiety. I rang NSW Police Media late last night and spoke to a senior constable about the posts. She replied saying that there was a dedicated person in charge of NSW Police social media and that no-one would be available to comment. Late night comments were only available for "major emergencies". I'd say domestic violence is a major emergency in Australia – and there are six dead women this year alone who make it more urgent than ever. And the post on the NSW Police Force's page makes it very clear that we don't yet have a set of guidelines which report responsibly or respectfully. Why weren't these comments moderated? Why imply that women are the perpetrators when there's plenty of evidence from multiple sources demonstrating that it's just not the case (and it's clear from the ambiguity of the post that the writer knew that men are perpetrators against their male partners)? Baulch says the domestic and family violence community is devastated by the remarks on the posts. It's come at a crucial time in Australia. Police and non government agencies have been working together to encourage women to come forward and seek support. She says that if we don't begin to have a nuanced conversation about why the overwhelming majority of victims are women and their male partners the perpetrators then we are undoing decades of important work by both men and women working in the violence prevention field. What's certain is that this is not the way to move the conversation – or the reality – forward.